Saturday was another gorgeous day at Del Valle in Livermore, CA! With the mildest breeze, and reaching 80 degrees with robin egg blue skies, families hit the lake for some fun and adventure. This type of weather, in this location is a picnicker's paradise, but can make the fishing a little tougher. Personally as an angler I find it easier to catch fish under cloud cover, with wind and a little rain. With that said, Saturday still produced some good bag limits of trout. 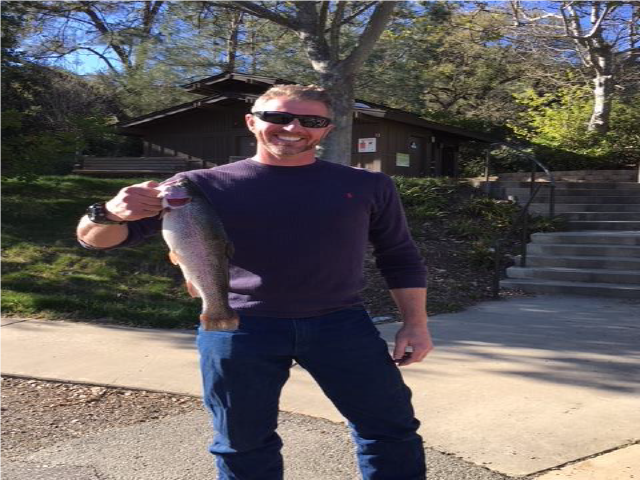 The largest reported trout came from Joe Jordan and son Zachary Jordan (from Livermore, CA) weighing in at 7.0 lbs. The large breeder was caught just past Swallow Bay, while throwing Kastmasters from shore. Congratulations!! 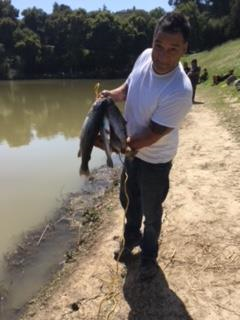 Ray Muscat and fishing partner had a very successful day on the water using nothing more than backyard earth worms. They boated several trout, with the largest at 5 lbs. a nice cat fish, and several large mouth, and small mouth bass. Great job guys! I once again ran into Bernie (from Fremont, CA) on the water. In the morning hours he boated several bass using Brush Hogs. The bite was tough, and morning seemed to be the key word for most fishermen on Saturday. Almost all of my bites came before noon as well. Finishing my day with 7 opportunities, I boated 5 small mouth bass, and 1 large mouth, and lost another large mouth at the boat. 2 bass came on a weightless 5" Senko in Swallow Bay, and the rest came while testing two reaction baits ( 3-1/8" Storm, Arashi Spinbait, and a Strike King, Pro Blue KVD J200 Jerkbait). I enjoy testing different lures and finding what works for me. I caught my largest small mouth on the day at 2 lbs. with the Spinbait. I was able to reel it slowly and its 3-2 prop design preformed perfectly, like a subtle baitfish sneaking around. The bulk of my hits came from Jerkbait.